When I first arrived in Japan and started searching for resources to learn Japanese online, I found JapanesePod101.com everywhere I looked. This Japanesepod101 review will help you decide whether JapanesePod101 is right for you. Later, I remember considering signing up to their website, but without knowing if it was any good or not, I ended up not doing it. More recently, I've been using their sister-site, CantoneseClass101, to help me learn Cantonese, and I found it to be pretty helpful. Now, almost 5 years after I first arrived in Japan, I decided to go back and investigate the Japanese site to see what I missed out on by not joining back in the day. I'm going to take you inside the paid members area, with a video showing you the main features of the website, and then give you my honest assessment of the quality of the product (Hint: there are good and bad points!). If you don't have the time to read the whole review, then I'll summarise it here by saying that it's a good, engaging resource, especially for beginners and lower levels. Their bite-sized approach to study materials makes it appropriate for busy people and those who struggle with motivation, but it is certainly not any kind of shortcut and you will still have to do the hard work yourself. To help you with that hard work, I've put together my own guide for using the site as effectively as possible, and getting you speaking Japanese quicker. More details at the end of the review. 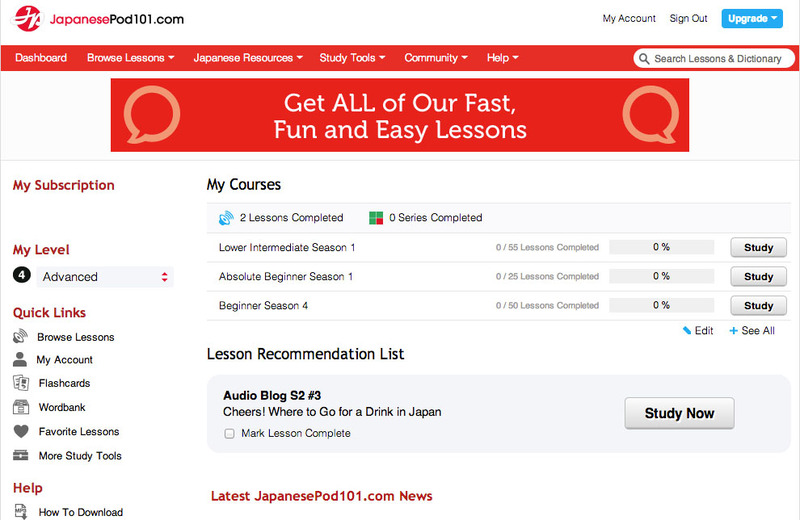 JapanesePod101 is a website that houses a series of Japanese lessons in audio format. It works on a freemium model, meaning that some material is available for free (sneakily offered to you as a free lifetime subscription), but most of the good stuff requires you to buy a subscription. Some people are reluctant to pay for online products, preferring physical books instead, but I think times have changed and some online language products are becoming quite good. There are different pricing options for JapanesePod and, as usual, the longer your subscription the cheaper it gets. In my opinion, the pricing is reasonable. If you take the cost of a 1-year subscription as your baseline (whatever language learning resource you buy, youd probably aim to get through it within a year if youre serious about progressing), which is US$180, then the cost is a lot more than a book, but substantially less than other commercial products  Rosetta Stone ($399) or Pimsleur ($345 for 30 lessons), for example. And to be honest, if it works, why wouldn't you pay $180 for it? Learning is arranged in courses of up to 50 lessons each, arranged by proficiency level, ranging from complete beginner to advanced. Lessons are delivered in audio format, and are generally 12-15 minutes long. You can listen to them on the website itself or else downloaded it all as podcasts, which you can then put on your smartphone and take around with you. On the website, there are a few powerful features accompanying each lesson, and, for me, are the most valuable part of the product. The dialogue is given in an interactive format: each line is clickable, so you can hear the audio at your own pace, line-by-line, and you can switch the text between kanji, hiragana, romaji and English translation. This works really well, and is ideal for breaking down the dialogues into smaller parts, listening and reading at the same time, and is great for improving your vocabulary and listening comprehension. Another page gives you a list of vocabulary from the dialogue, which, again, is clickable so you can hear the audio (natural speed and slowed-down) and see how its written. What you can then do (and here's the fun stuff), is choose the vocabulary you want to learn and export it to a flashcard programme thats built into the website. 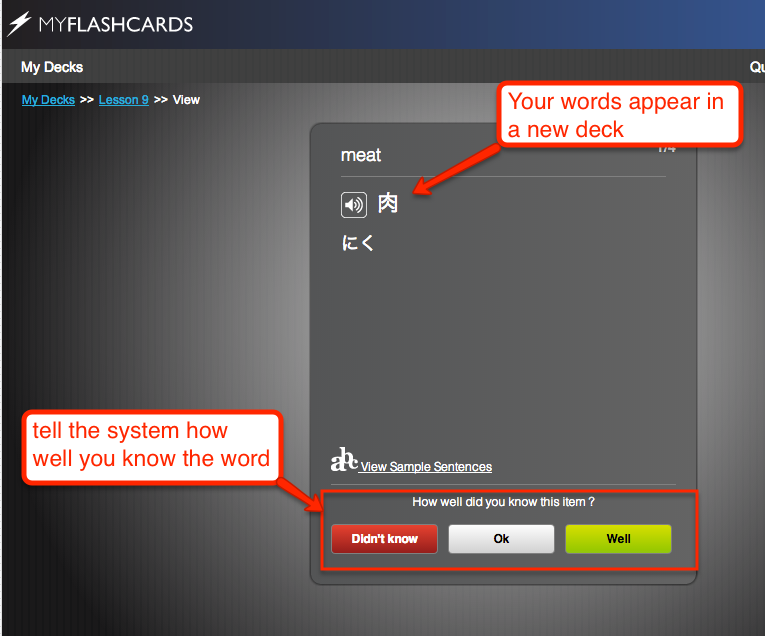 These flashcard decks are fully customizable and use a spaced repetition system to help you learn them. Note from Olly: If you want to learn to read and write hiragana, did you know you can do it in just a few hours? Click here to find out how. All of the lesson material is available in downloadable worksheets. Theres nothing special about those, its just a physical version of the information given on the website. Nevertheless, people like to consume information in different ways, and if you like to have everything printed off and there in front of you, its good to have. In addition to the lessons, there is a wide range of extra resources for beginners, which, for me, adds real value for people learning Japanese for the first time. 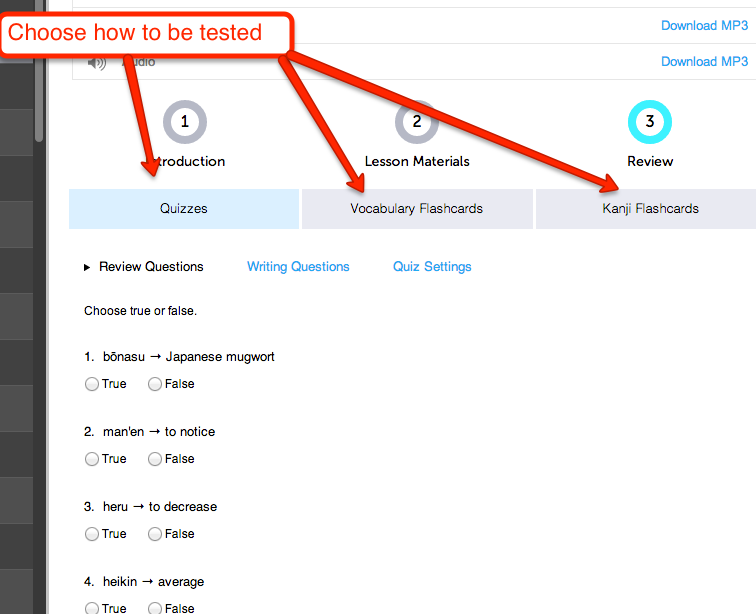 A couple of other nice features include a quiz function, which gives you vocabulary and writing tests based on language from the lesson, and an online dictionary Japanese-English and English-Japanese dictionary (accessible from the search bar, which is handy) which is well-linked to the language from the lessons and lets you export words directly to flashcards. Its unquestionably a substantial resource, with a lot of material for every level. They keep adding to it regularly and making additional lessons (“seasons”) for people who might take longer to progress. The people who designed the course know what theyre doing. Its not easy to select and produce graded material for an entire language course, but Ive been impressed with the content. They recycle grammar points and language over the course of each level, which is good to reinforce what youve learnt. The podcast lessons are digestible and entertaining, so its great for anyone who lacks motivation, or is looking for an easy way to get started. Its important to note here that listening to the podcasts is only going to be one small part of the process of learning Japanese  you need to compliment it with more involved study, but even if you did nothing more than listen to the podcasts in the car for a month, you will undoubtedly learn a lot. The fact that the lessons follow the same format help to give structure, compartmentalize learning, and really make it clear what's being discussed, which might be good for some people (not for others  this depends on how you like to learn). The difficulty of the different levels is pitched just right. The progression from beginner to upper-beginner and then to intermediate is well-managed, just like their Cantonese sister-site. The grammar that they teach in the lessons is relevant and well presented  easy to understand and usable right from the start. 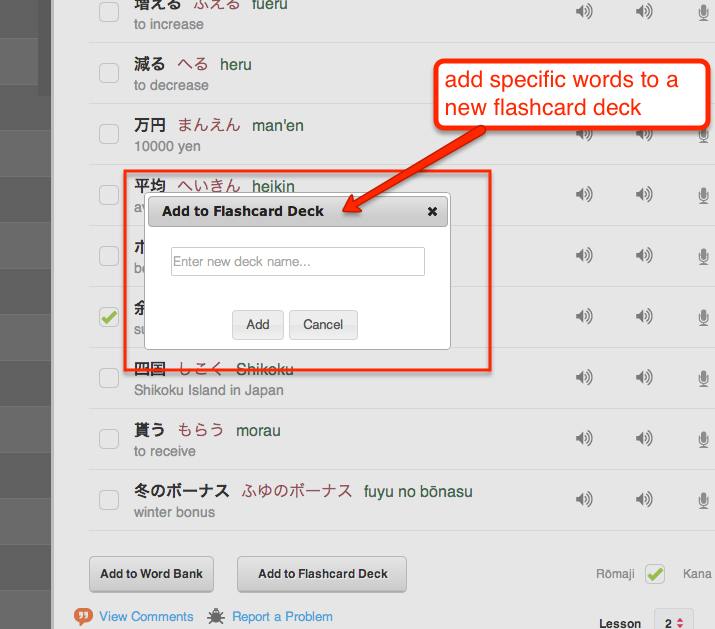 The flashcards feature works well and is very useful (if you dont mind all that time in front of the screen). The line-by-line clickable dialogues with audio, transcription and translation are AWESOME. For me, theyre the main draw of the product and worth the price alone. 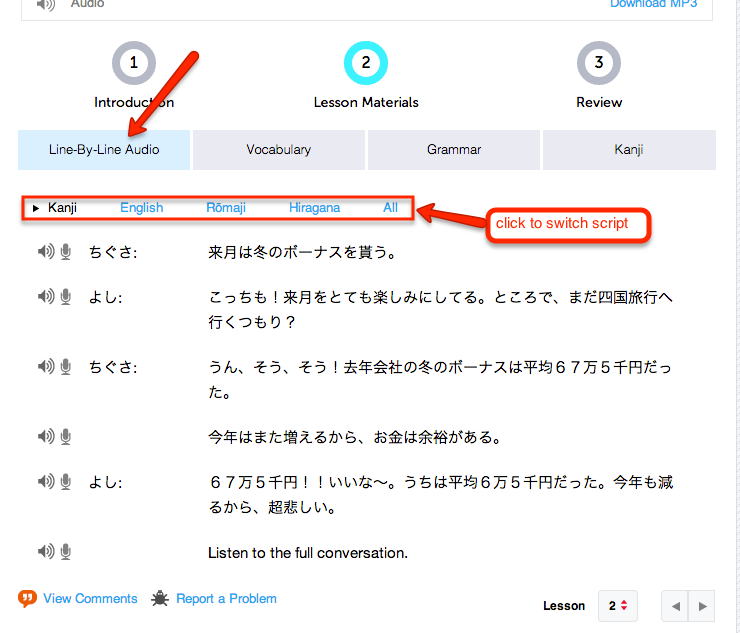 Each lesson comes with a comments section where you can ask any language questions you have. They have native-speaker staff who are good about responding promptly to questions, which is very handy, and one definite benefit of the online format. You can also learn a lot from other members questions, which are visible for all to see. There's a very active community of people on the site and there's a lot of interesting discussion about Japanese going on, which takes place largely in the forum. This is nice to see. There is a smart balance of Japanese and English on the podcasts for most people. That is to say, they use enough Japanese to give you some good exposure, but not so much that you get frustrated because you dont understand whats going on. Theres a great selection of information for beginners, as mentioned above, including fantastic resources for learning to write hiragana and katakana. Its handy to have the printable worksheets, which summarize information from lesson. Having the lessons available in podcast format is great, because you can make the most out of your time  you dont have to be sat at the computer. The dialogues in lessons are short, which is good for beginners, but frustrating when you get more advanced. In fact, the reason I probably wouldn't use the site much with my level of Japanese is because I feel a need for more substantial, higher level texts that I can sink my teeth into. Even at higher levels, the dialogues are all under a minute. This is understandable given that its all based around podcasts and the need to keep it digestible, but, just like with any resource, it cant be all things to all people. Even after signing up, there is a fair amount of advertising, up-selling, and cross-promoting related products (by way of emails, in-site banners etc), which is irritating when youve already paid for the product. They could learn a thing or two about customer experience. The resources are, at times, not very cared for, which is a bit disappointing for something you pay good money for; podcasts are sometimes poorly edited, the voice recorder function doesnt seem to work most of the time, and the information across the different study tools is not always consistent. For example, some words in the database dont come with audio recordings, some translations are inaccurate or misleading (although staff do correct them once pointed out by members), and there are occasional programming bugs like the fact that opening the comments box in lessons resets the lesson page you were looking at, meaning you have to click all the way back through. None of this is a deal-breaker, but it does leave you feeling a bit neglected! The vocabulary lists and flashcards work with single words out of context, which is a big missed opportunity. If youre a regular reader youll know that I go on about this quite a lot! Of course, you can see the words in context within the dialogues, and there are often sample sentences given in the flashcard programme, but Im a big believer in keeping words in full sentences at all times, especially when revising. One issue I have with the lessons are, ironically, the fact that they are just that  lessons. What do I mean by that? In one 15-minute lesson, there are only 30 seconds-ish of sustained listening to Japanese (the dialogue). The rest is teaching  explanations of vocabulary and grammar. You might find this frustrating after a while (specifically once you've been through the lower levels and reach the intermediate course). It wasnt that the teaching isnt useful or good quality, its just that you need to change things up a bit and spend more time with the language. I would like there to be more material for extensive listening, so you can just listen and enjoy without having to always be taught something new. At intermediate level, one of the presenters speaks exclusively in Japanese during the lessons, which is great, but its not quite enough, as English is still the medium of instruction. However, this shouldnt necessarily put you off  if you want well-targeted, digestible language lessons, and/or can get your main exposure to Japanese elsewhere (such as TV dramas or audio books), then this isnt a problem. Vocabulary lists from the lessons dont always contain all the useful words from the dialogues. Instead, there words that are related to the topic. While theres no harm in seeing related vocabulary, the fact that you havent heard it in the dialogue makes it a bit random, and it would be much more useful to provide the vocab that youd already heard. Its often the case in the lessons that you want to know what a word means, but its not given in the vocab list. You can look it up in the dictionary that comes with the website (and from there you can export those words to flashcard decks), but its unnecessary and interrupts the user experience. 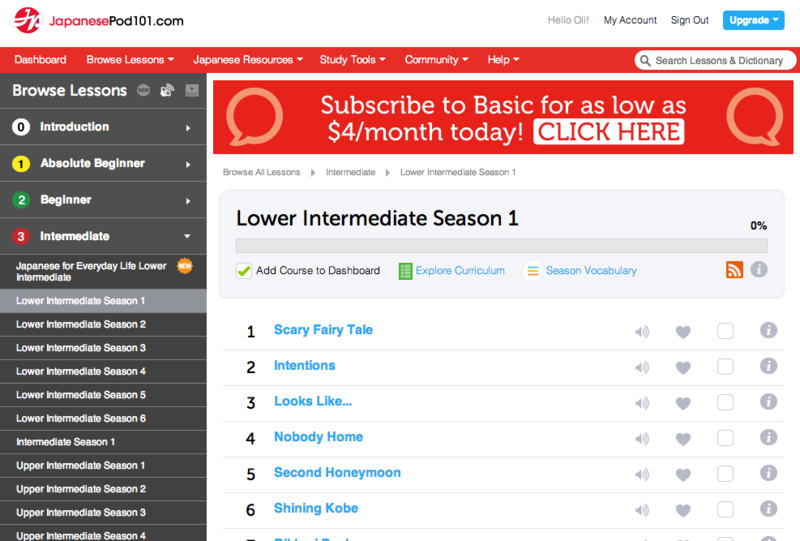 Overall, I find JapanesePod101.com to be a substantial, well-made resource for learning Japanese. Its been designed to be easy to consume (hence the podcast format) and so despite my issues with the teaching format, its going to work well for people who dont know where to start, arent easily motivated, or just want to be walked through a learning programme. For this reason, more independent learners may find it limiting. The tools on the website, especially the line-by-line clickable dialogues and the built-in flashcard tool are excellent, and really make it possible to get stuck in and analyse the language. The course designers and material-writers are good and have designed quality content  its just a bit of a shame that the marketers behind the scenes have been given slightly too much freedom, as youre left with the impression youre getting sold to a fair bit. However, this shouldnt take away from the value of the Japanese content itself. Remember that this is just one language learning resource. 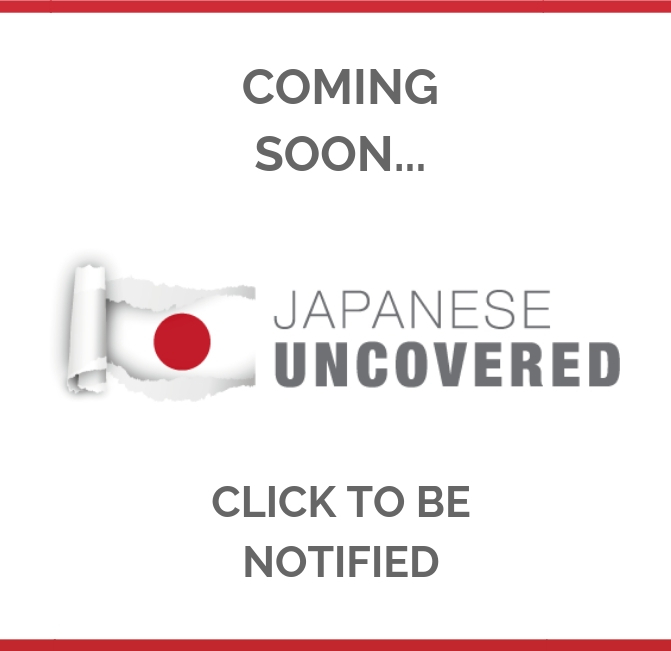 Like any other book, audio course, or even language school, dont be under the impression that its any kind of silver bullet, or that simply buying this will be any guarantee of you learning Japanese. Many people will be tempted to just rely on the podcasts, because theyre there, easily digestible and entertaining, but you still need to spend just as much time (and probably more) with your head down, stuck into the lesson transcripts and vocabulary sections to really improve at a good rate. You will also eventually need to find ways to start speaking before becoming fluent in Japanese. Its not just about the studying  youve got to get out into the real world too, something that is often forgotten. So, in conclusion, this is a good product with a lot that can help you. Whats important is that you keep an independent, self-directed approach to your learning, and use this product as a resource to learn what you need, rather than letting it direct your learning for you. To help you do this, Ive written a guide that shows you how to make the most out of the features on the website. Through a lot of trial and error over 6 months of study, I figured out how best to use the dialogues and resources to improve my Japanese much faster than simply following their lessons through one by one. The guide is free  click here for more. I hope this review has been informative and that you have a better idea of whether JapanesePod101.com is right for you or not.